Do Medicare Part D plans cover the shingles vaccine? Question: Do Medicare Part D plans cover the shingles vaccine? Answer: Yes. Medicare Part D prescription drug plans do cover the shingles vaccine (stand-alone Medicare Part D plans and Medicare Advantage plans that include drug coverage). However, coverage (and cost) of the vaccine can vary depending on your chosen Medicare prescription drug plan, vaccine, and the pharmacy where you have the vaccine administered. Please note, the new shingles vaccine Shingrix® (approved by the FDA in October, 2017), is now available on most Medicare Part D plans and Medicare Advantage plans that include drug coverage. Review plans that cover Shingrix® in our Drug Finder (see below for an example search result). "CDC recommends that healthy adults 50 years and older get two doses of the shingles vaccine called Shingrix®, separated by 2 to 6 months, to prevent shingles and the complications from the disease. Your doctor or pharmacist can give you Shingrix as a shot in your upper arm. Shingrix provides strong protection against shingles and postherpetic neuralgia (PHN). Two doses of Shingrix® is more than 90% effective at preventing shingles and PHN. Protection stays above 85% for at least the first four years after you get vaccinated. Shingrix is the preferred vaccine, over Zostavax®, a shingles vaccine in use since 2006." If Shingrix® is not on your Medicare Part D plan drug lists (formularies), please speak with your Medicare Part D plan's Member Services department and ask when the plan will be adding Shingrix® to their formulary. As reference, the shingles vaccine, Zostavax® was approved in May 2006 by the U.S. Food and Drug Administration (FDA) as a vaccine for use in adults ages 60 and over who have had chickenpox. Zostavax® is covered by most Medicare Part D plans, however Zostavax® can be treated differently depending on the plan. In most cases Zostavax® is treated as a Tier 3 or Tier 4 medication and in some cases requires prior authorization or falls into the step therapy program. Please check with your specific Medicare Part D plan to determine the handling of Zostavax®. 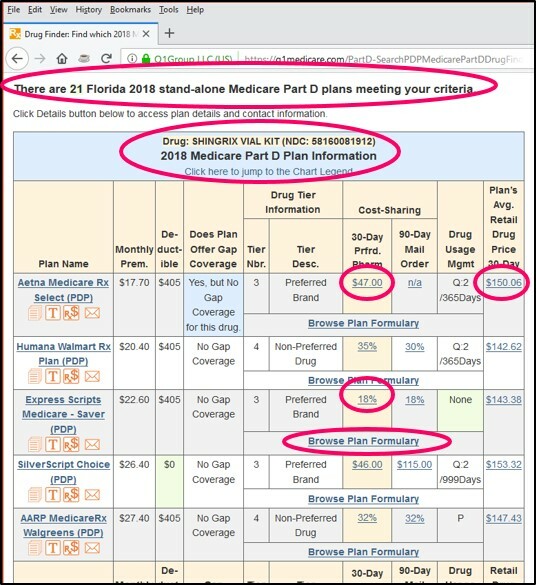 You can see the coverage for Shingrix® or Zostavax® (or any other this medication in your area) by using our Medicare Part D Drug Finder (Q1Rx.com). Just select your state of residence, enter the drug name such as "Shingrix" or Zostavax" (or other drug name - or partial drug name), and click on the green "Search" key. If your chosen medication has multiple strengths or forms, you can choose the correct dosage or delivery form and click "Search" again. You should see the results of the plans covering your chosen drug and the cost of coverage - and the estimated average retail price, when available. Medicare Part A and Medicare Part B does not cover Shingles Vaccine. Please note, Medicare Part B (out-patient care) does not cover the shingles vaccine, but you can have your doctor administer the vaccine in their office Your doctor probably cannot charge your Medicare Part D plan for the vaccine, so you can pay your doctor out of pocket, and then ask your Medicare Part D plan to reimburse you for the cost of the vaccine. As noted by Medicare: "Shingles shot - How often is it covered? The shingles shot isn’t covered by Medicare Part A (Hospital Insurance) or Medicare Part B (Medical Insurance). Generally, Medicare prescription drug plans (Part D) cover all commercially-available vaccines (like the shingles shot) needed to prevent illness. Contact your Medicare drug plan for more information about coverage." "Can the co-pays for the shingles vaccine (Zostavax) vary by the pharmacy where purchased and administered?" Please remember: We are not physicians, nor are we pharmacists. The above information is strictly for informational purposes. Please consult your doctor or pharmacist when determining treatments.